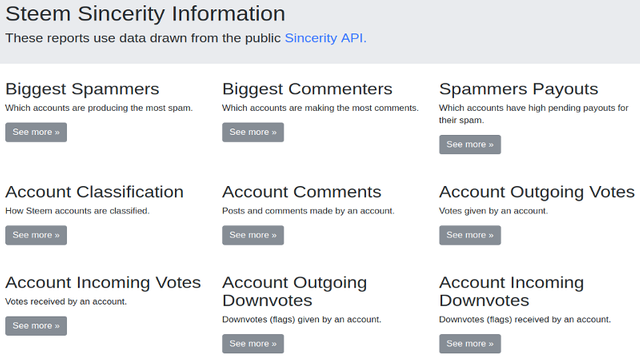 I have added a few extra Sincerity API methods, and accordingly also make them available to end-users through SteemReports. Shows which accounts have made the most comments in the most recent 14 day period. You can click on the account name, post count or comment count to see further relevent information. Show the comments and posts made by an account in the last 7 days. You can click on the post or comment to go to the steemit.com page for it. Shows the votes given by an account in the last 7 days. You can click on the authors or comments they were given to to see those steemit pages. Shows the votes received by an account in the last 7 days. You can click on the authors or comments they were given to to see those steemit pages. There are also similar pages for Outgoing Downvotes and Incoming Downvotes. Until I setup the Sincerity database, SteemReports didn't store each vote separately. So this change should facilitate some more interesting stats in coming weeks. You are doing a great job and this will assist @steemcleaners and others immensely. Thank you for all you hard work and your outstanding tools! I use them almost daily. Have a great day, today and everyday!